NIA's Dr Claire Skentelbery was part of a high level round table co-hosted by Industry4Europe, a coalition of over 140 industry associations and the European Economic and Social Affairs Committee (EESC), titled ‘EU Industrial Policy: Results and prospects for the next institutional cycle’, together with the EESC. Over a 2 hour period, Moderated by René van Sloten of Cefic, the panel discussed challenges and achievements for industrial development from the institutional cycle now coming to a close, and Industry4Europe Members Koen Coppenholle (CEMBUREAU) and Claire presented coalition priorities on governance and indicators, while Philippe Citroën (UNIFE) introduced the newly published Joint call to Heads of State and Government to make a pledge to put industry at the top of the political agenda of the EU during the next institutional cycle (2019-2024). 200 participants joined the meeting and stayed for a drinks reception followig the panel close. 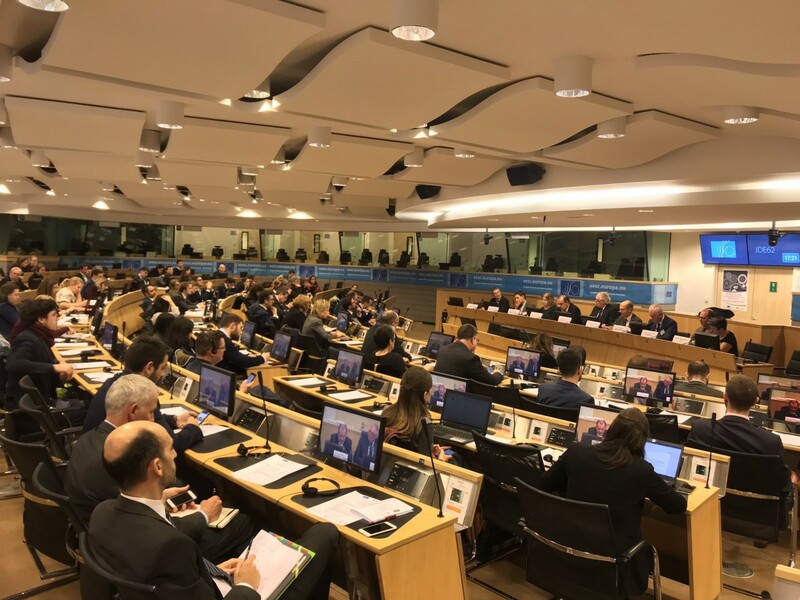 Panel members also included Mark Niklas (European Commission), Luca Jahier (President EESC), Lauro Panella, Cosmina Miu (Perm Rep Romania) and Luc Triangle (IndustriAll Europe). The common theme emerging from priorities across the panel members focussed on the need to enable jobs and skills to address changes from internal and external pressures to Europe. Citizens need to be active participants in next generation technologies and economic activities and Europe needs to ensure equality of impact from an EU level industrial policy.